For the 11th movie of #SHOCKTOBER 2015, I've returned once more to the found-footage genre. Digging Up the Marrow is a mock documentary, following director Adam Green, playing himself, as he goes in search of real-life monsters. I should probably preface this by saying that I have not seen any of Adam Green's TV series, Holliston, which is now in its second season. If I had seen that show, I would probably be much less surprised by how good of a job Green does as an actor in this film. I knew that he had horror chops, having seen and loved both Hatchet and Hatchet II, but wasn't sure how he would fair in front of the camera. Turns out, he's a pretty charismatic, animated fellow and he transfers over to film very well. 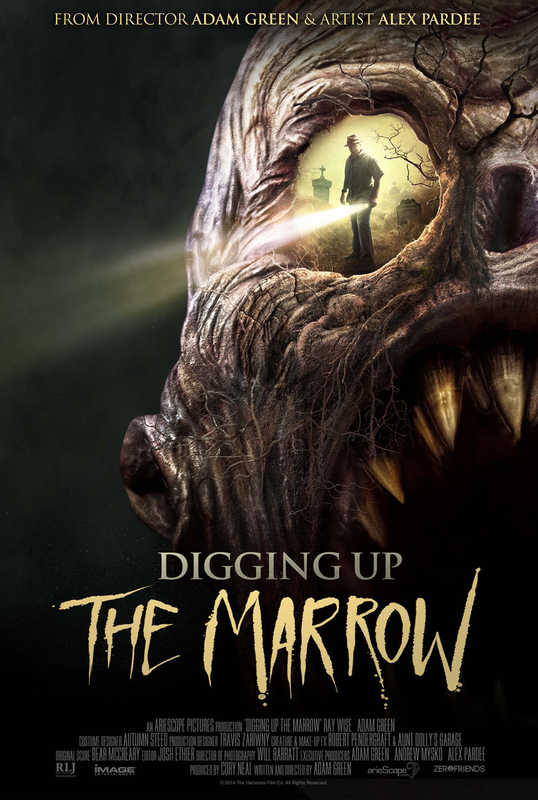 In Digging Up the Marrow, Adam is approached by a man, William Dekker (Ray Wise), that claims he can prove that monsters are real. This leads to Green and his cameraman, Will Barratt, following Dekker out into the woods to observe these monsters. Much of the film is spent trying to determine whether or not Dekker is just a crackpot, or if there is something more substantial to his claims of monster sightings. The performances are good all around, and there's even a cameo by horror genre staple Kane Hodder. For a found footage film, I was frequently awed by the picture quality and cinematography. This may be related to my having just previously watched V/H/S, in which the picture quality is as grainy as possible. Clearly both films made differ net decisions in terms of their aesthetics, but watching these films on consecutive days really highlights the range of quality possible in the found-footage genre. There is some discussion within Digging Up the Marrow as to the true nature of monsters. Dekker presents these fiends as mutated human births, just trying to live out their lives in the relative peace of their underground kingdom known as the Marrow. The monsters are also rather content to continue living in obscurity, and do not take kindly to the presence of the men and their film equipment. Although the film does take its time getting there, once the creatures are eventually shown on film I found the designs to be imaginative and fulfilling. The monster attack sequence is particularly well-done. Overall, I enjoyed Digging Up the Marrow. I was fond of the light-hearted take on the horror genre after watching some more serious horror films in the days leading up to this one. This film is funny and only sometimes terrifying. I think it's a good film to sit down with friends for whom horror is not necessarily their forte. As always. I look forward to the next project from Adam Green. Two out of Four Bruces.